As I draft this blog, we are at N 62.17 & West 64.00 – 150 miles N by NE of Cape Chidley, Labrador. We are hoping the weather holds to the forecast, so that we can arrive at an anchorage before the winds turn south and increase into the 20’s. That would not be a comfortable ride. Let me back up a little. 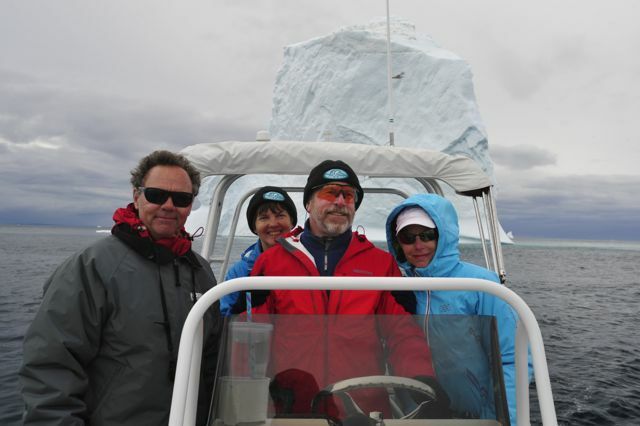 We departed Greenland at 04:00 Monday 25 Aug. for Baffin Island. Based on the weather and conditions, we elected to cross almost due west and then run down the coast of Baffin Island, so we could seek protection when the weather required. We were all alone on the crossing, having split with our dear friends – Capt. Gulliver, George, and Marci. Migration was heading south along Greenland to position for a crossing to Europe. (Since then the Volcano on Iceland decided to erupt, which makes their crossing even more challenging.) Our crossing was projected to be a 30 to 36 hour trip, with the roughest weather of the trip for the first 6 hours and then a return to our standard conditions of near flat seas. We woke Monday to a beautiful clear morning and calm weather inshore, but once we left the protection of land, we had 1 to 2 meters seas with winds in the 20’s, both on our Starboard Beam. Needless to say, the stabilizers were getting a good workout. The sea state caught our crew member, Matt, by surprise, but he recovered quickly as things calmed down. 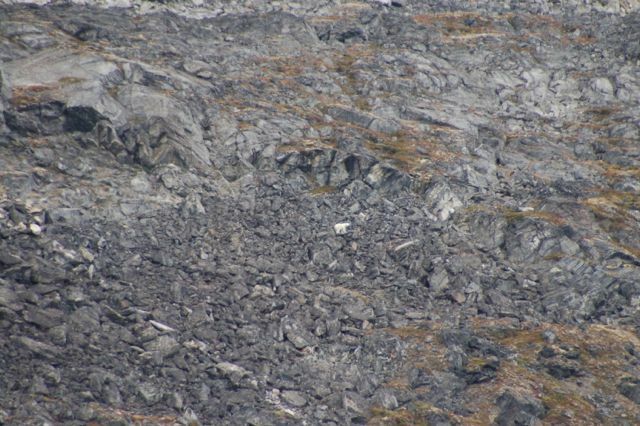 Look closely – there is a polar bear in this photo! On the last 100 meter run to our anchorage position, what does Kathy spot, but a polar bear wandering among the almost vertical cliffs! Once anchored we watched it for a little while, before settling down for a nice dinner of stir fried leftovers in rice, with some Greenlandic shrimp added. Of course by now the weather had turned and it was raining and mostly blowing outside, but we were sitting perfectly still. We hardly moved the whole night and did not once stretch out the chain. We woke to a key decision. The weather router had suggested we stay anchored until Noon, before proceeding south. But it was pouring rain and other than watch the polar bear wander around (he was still there) before settling down for a nap and shower there was not much to do. We decided to stick our nose outside to test conditions. There was a backup anchorage just 12 miles south if things were too rough. As we come out of our protection, we were able to follow our inward track for ¾ of the way before turning to head south. Shortly thereafter we were all holding our breath, as the depth rose from over 175 m to 14 meters before heading back down. By the time it had reached 20 m, the boat was in neutral and we were moving at less than 2 knots. 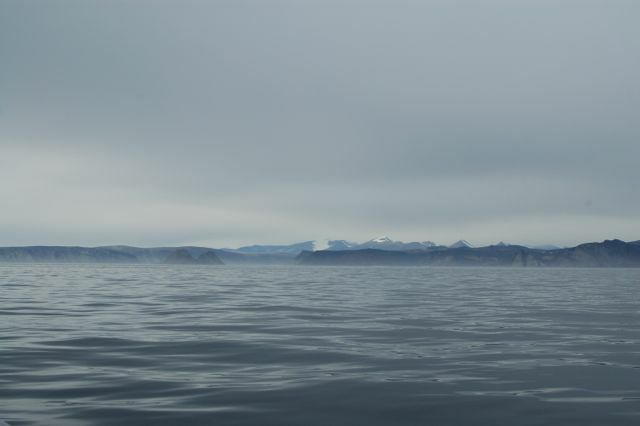 We had passed over an underwater mountain. Once outside, the wind was as predicted – 20 to 25 knots from the NNE with 1 to 2 m seas. Both following us, so it was a very comfortable ride. We continued in uncharted territory for several hours, before the shore fell away to the west and we were in 100 to 200 m water. After spending several hours studying the latest weather forecast and looking at our options, we decided to make a two-day run for Cape Chidley, the northern point of Labrador. The forecast continued to call for South to SE or SW winds in the 20’s beginning midday on Friday. On a direct shot we had 381 miles to cover in 48 hours, +_ 6 before the weather turned. If we elected to hedge our bets and stay closer to shore and some bailout anchorages, the trip would be 50 to 75 miles longer and we could not make the crossing of Hudson Straits before the adverse weather arrived. We elected to take a shot and re-evaluate Thursday morning. We sent our plans off to our wonderful weather router Maik (in Iceland) and headed south. This is where I started at the top. The conditions and forecast have been spot on. We are on target to make our anchorage before the weather changes, assuming it does not come early. We had an incredible night, with seas and winds dropping and a multi hour Aurora Borealis show. Our main meal today, which we eat midafternoon when underway, is my favorite passage dish. It is crockpot chicken, with corn, green beans and cornbread stuffing on top. Kathy prepared it after her early morning watch ended at 07:00 and it will be ready by 15:00. Ah, now back to the topic of the title. While we have thoroughly enjoyed Greenland and would return some day for further exploration (only with a buddy boat), this has been one cold summer. In fact this summer was colder than some of the winters experienced in Virginia. With the exception of the afternoon hike at the Torngat Park in Labrador a month ago, we have been dressing as if we were in Colorado for winter skiing. The average temp has been between 1 c (34f) and 4c (40f), with most days overcast or raining, creating windchill of round 0 c or 32F. Typically we have on long underwear, pants and then heavy foul weather gear. On top we have 2 to 3 items, an Under-Armor turtle neck, a Patagonia high-tech shirt and then some type of sweater, before putting on Foul weather jacket, ski hat, gloves and heavy water proof boots. We wear no cotton, electing almost exclusively the new high-tech breathable moisture wicking fabrics, to keep from getting chilled by sweat. As you may remember from an earlier blog, I spent some time collecting mussels in Rodebay, where I was in the water up to my knees and elbows. I can tell you, that after 30 minutes collecting, I got colder than a full day of skiing during a snowstorm! It took me most of the day to warm up. Because we elect not to run a generator while we sleep, some might find our conditions a little rustic, as the inside temp often dips into the low 50’s during the night, before the morning generator run and heat. Since we normally slept with heat set to 50 in VA and a window open in the winter, we enjoy a chilled room. It can be a little nippy when getting up in the middle of the night to use the head – which as most of you can relate seems to happen more frequently each year. This summer was cold – this was a typical day! Going for a tender ride, moving along at 15+ knots can be quite interesting. I very much would like to return to Greenland during the winter for some dog sledding and snowmobiling. I imagine it would be wonderful to get further inland than we were able to. I must also say how helpful everyone was to us. While the average person on the street is a bit like a New Yorker in that they don’t make eye contact when passing – once asked for information they become very friendly, although language is an issue here. Most are fluent in Greenlandic (Inuit) and Danish, but English is not widely spoken. Greenland has instituted a coastal watch system for boaters – Aasiaat Radio, much like Australia and New Zealand that is very reassuring. 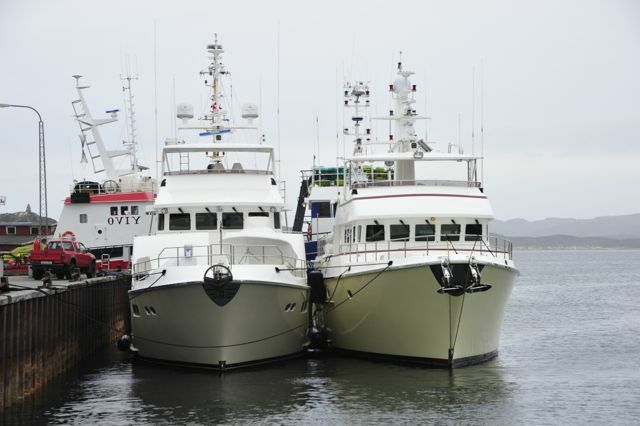 When moving the boat – commercial or private, you check in them every 6 hours and when at anchorage every 24 hours. If you do not report in on schedule, they will initiate an escalating series of events including search. We have heard them looking for boats that have not reported in as scheduled. Conditions in Greenland are very unforgiving and receiving help quickly if something goes awry is critical to controlling the situation so this system was very re-assuring for us! In closing, I would say, cruising Greenland is not for most boaters. But if you are going to go, go with a buddy boat, develop the skills required, make sure your vessel is in top condition and be prepared for some real challenging cruising – Fog, Icebergs, only commercial docks (sometimes a challenge to get on and off!) and very tenuous anchoring situations. In addition I would strongly consider a survey of your boat by Steve D’Antonio, and make sure you have an outstanding inventory of spares. There are also some special items to be taken along, an ice pole for pushing small growlers away from the boat, extra long anchor rode and plenty of warm clothes, heavy foul weather gear like usually seen on a sailboat, including very tall and warm foul weather boots. Lots of different waterproof gloves are also important. In addition you will need redundant communication systems for weather, safety items like a SPOT Tracker, and a very experienced high latitude weather router for the crossing to and from Canada. I also want to take this opportunity to thank some key friends and family who carefully track our adventures daily and are on call to help in an emergency. In addition to my daughter Margy who now has her hands full with a 2 month old and a 4 year old, there is Alan P. who I raced and shared a house for years, and most importantly Mr. Spencer from NZ who is a world class boater, experienced sailor and trained in marine rescue who closely monitors our every move. This team gives us great comfort as we know we can reach them at an instant for assistance. From the bottom of our hearts – Thanks All! Will let you know if we beat the weather in our next blog – ☺. Captain Gulliver didn’t mind the cold. He let his hair grow out. This entry was posted on September 18, 2014, 8:23 am and is filed under Trips. You can follow any responses to this entry through RSS 2.0. You can leave a response, or trackback from your own site. Bradley and Kathy: Inspiring, as usual! I envy you. This report is particularly indicative if the remarkable skill you have honed in your travels. I hope someday to share an adventure like tis with you. Fair winds and following seas! !